Salsas are an important part of summer, whether you’re a casual taco night enthusiast, you go all-out nacho party, or you’re one of those people who puts salsa on everything (no judgement here). We’ve rounded up 13 creative homemade salsa recipes to switch up your routine: Some are sweet, some are savory, some are spicy, but all are simple, fresh and summery. 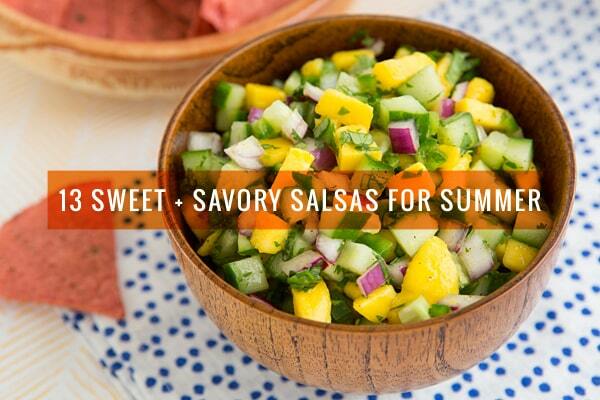 If you can track down champagne mangos, use them in this refreshing salsa recipe. Slightly charred onions, tomatoes and jalapeños give a slightly smoky depth to traditional salsa in this recipe from PureWow. Mangos and black beans make a delicious—and colorful team—in this salsa from Eat Healthy Eat Happy. This creative recipe from Orchard Street Kitchen is a little bit crunchy, a little bit tropical. Caramelized tomatillos make for a blissful (and foolproof) salsa from Chef Savvy. Strawberries? In salsa? According to Kitchen Treaty, it totally works—and we'd have to agree. No need to head to a Mexican restaurant. Just grab a pitcher of margaritas, a bag of chips, and this fresh and easy salsa recipe fro That Girl Shannon. Super crunchy and refreshing, this mild salsa from Ricotta & Radishes is also great to mix into pasta salad, or as a relish for veggie burgers or hot dogs. Soup Addict's tangy, tart salsa is perfect for holidays, or any time really. Crunchy apples and tangy apple cider vinegar lend unique flavor to this recipe from Floating Kitchen. A simple, slightly spicy salsa that's sweet—but not too sweet. Sweet and savory, this innovative fruit salsa from Cookie Monster Cooking is sure to be a potluck hit. The name sort of says it all in this recipe by She Likes Food. Great roundup! The Mango Black Bean Salsa sounds amazing! I’m very into the sweet/savoury thing so these are right up my street. Can’t wait to try the Cucumber-Mango & Apple-Pineapple. And then all of the other ones….